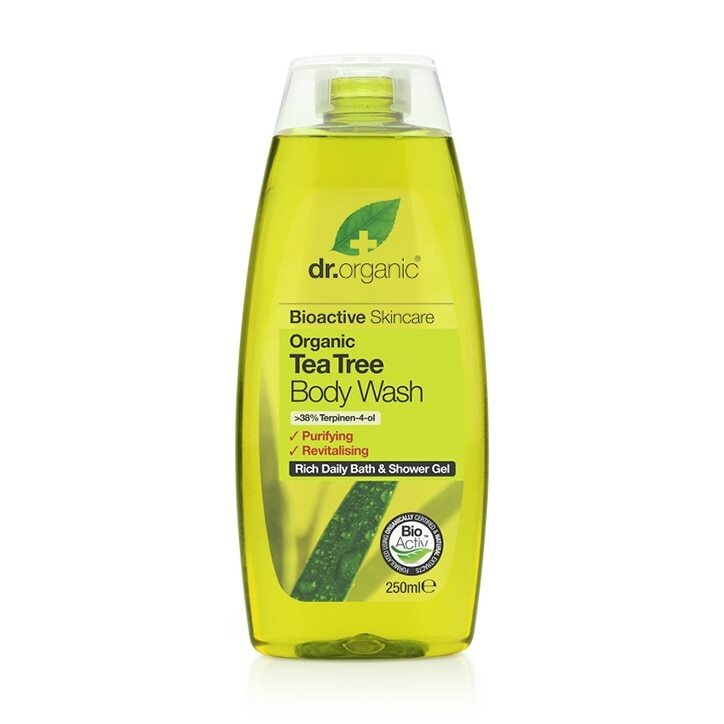 Dr Organics tea tree body wash is a daily wash for use the shower or bath. Ideal for normal to oily skin, blemishes, blocked pores or excess oil thanks to the effective blend of natural cleaning agents and effective essential oils. This body wash combines aloe vera leaf juice, tea tree essential oil and peppermint essential oil to hygienically cleanse blocked pores, remove dirt and excess oil whilst refreshing the skin and uplifting the senses. Ideal for use every morning, after sport or exercise, or whatever you need for feel a natural deep cleanse. Can even be used on the hair. Lather and use as required on body and hair. Due to the ingredients natural origin, colour and consistency may vary from batch to batch. This does not affect the quality of the product. Aqua, Aloe barbadensis leaf juice, Cocamidopropyl betaine, Sodium lauroyl methyl isethionate, Lauryl glucoside, Sodium cocoamphoacetate, Sodium lauroyl sarcosinate, Sodium methyl oleoyl taurate, Coco-glucoside, Glyceryl oleate, Mentha piperita (Peppermint) oil, Melaleuca alternifolia (Tea tree) leaf oil, Sodium cocoyl isethionate, Tocopherol, Hydrogenated palm glycerides citrate, Sodium phytate, Citric acid, Sodium chloride, Benzyl alcohol, Sodium benzoate, Potassium sorbate, Alcohol. Avoid contact with eyes, if this should occur, immediately rinse with warm water. Dr Organic Tea Tree Body Wash is rated 4.5 out of 5 by 26. Rated 3 out of 5 by Peter 49 from Used for years I bought some more. Have been using for 10years or so with good results but 2 bottles in the last batch smell completely different to any I've had before. Not a particular nice smell at all.